I struggle with weekends at the moment. During the week I’m busy. 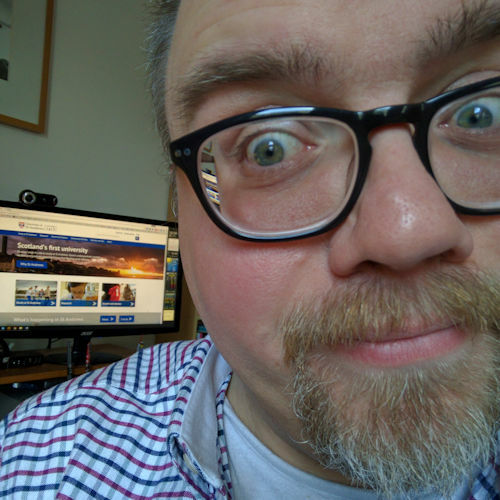 I usually rise around 05:45, say morning prayer, have breakfast (usually porridge… what can I say, I’m Scottish), get myself together and head in to the office early. In the evening I return to my flat and get stuck in to hall life and other little projects that I have on the go right now (writing, illustrating, music, reading). Most weekends I have my three children over, and I love it. I love them. I love being with them. I feel whole again. They have such energy, such life, such wild imaginations and we spend hours riffing off each other’s silliness with word play and rhyming (earlier today we had “stranger danger with the lone ranger”, and “I am Gimli, son of Glóin, son of… George?!”). Some weekends they come over on Friday evening, still in their school uniforms, bouncing with energy, irritable with tiredness, overflowing with cuddles. 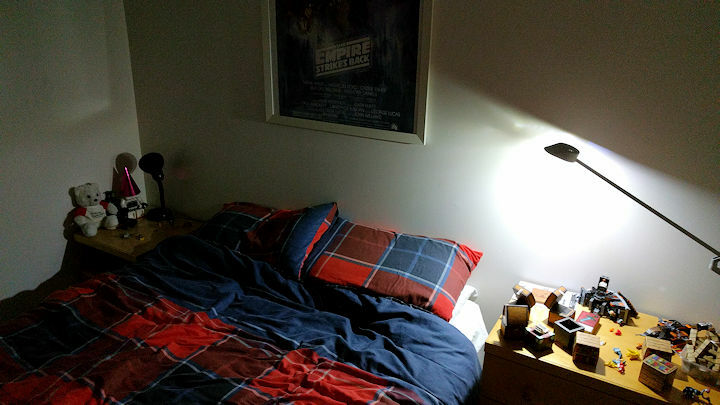 A few hours later, they are asleep in bed, and I’m either asleep too or I spend a quiet evening in the lounge enjoying the emotional glow of having my boys with me again. Saturday is usually filled with all sorts of activities. Reuben enjoys lying beneath his duvet on the bedroom floor with his tablet, watching cartoons on Netflix or Minecraft tutorials on YouTube. Joshua and Isaac migrate from the sofa to my PC and back to variously play computer games on my PC (mostly LEGO, although they’ve recently got into the multiplayer Ballistic Tanks and Dirt 3 rally) or their tablets. Usually at some point the LEGO comes out. Yesterday Reuben presented me with a packet of Papercraft models he’d received for his birthday asking for some help to build them. Translation: Dad, could you please build all of these for me while I watch? 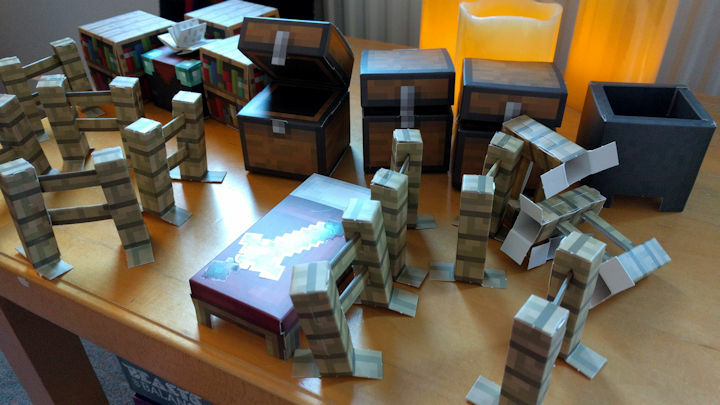 Minecraft, but on paper: Papercraft. This morning I heard Isaac (who will be six next week) exclaim, “Look at me! I’m doing elf parkour!” while playing LEGO The Hobbit. Sometimes we’ll go out, though by the weekend they are often ready for a quiet day in, especially if the weather is foul. (Me too!) Yesterday we went out shopping for new winter hats and gloves, and they then spent a couple of hours (and most of the heat from the flat) traipsing in and out to play in the snow. By Sunday lunchtime I generally begin to feel melancholic and heavy as I begin to anticipate the loss that I will feel when they have to go home. It’s unusual for me not to shed a tear after they are driven away. Not always immediately, but certainly at some point. On some occasions Joshua (mostly) has simply refused to leave and has curled himself up in a ball on the sofa in a sulk and has stopped responding to any encouragement to leave, or simply repeats “I don’t want to go!” Sometimes I’ve just let him stay for a few more hours and we’ve enjoyed a fabulously fun afternoon, just the two of us, before cooking dinner and driving him back to Anstruther in the evening. This is the hardest part of the separation for me. I’m sure I’ve said this before—I’ve certainly mentioned it in conversations more than once. I can accept that Jane doesn’t want to be with me: I’ve broken up with girls in the past. But it hurts to not live with my children. I’ve often wondered what other people think about me because I moved out. It wasn’t easy. I think it was one of the hardest things I’ve ever done. On the day I moved out, my brother at times had to physically carry me. I’ve never experienced grief like it—my father’s death nineteen years ago was a walk in the park (well, in the cemetery, at least) compared with this. I would have happily stayed with them but it’s less socially acceptable for a mother to move away from her children than a father. During the week, where I can, I nip over to Anstruther after work to see them for an hour or two, in a house from which my memory is slowly being erased. It’s not enough, but it’s better than nothing and it keeps me going until the weekend when we can enjoy another few days of silliness and laughter and cuddles together. This weekend, for some reason, the WiFi went off in my flat. So it was a good opportunity to introduce them to the wonders of setting up a portable WiFi hotspot using my smartphone (4G, thankfully). And then watching them gobble up about half a month’s bandwidth allowance in two days between them on their tablets. We also started to play around with Microsoft Kodu, which is designed to introduce children to computer programming. 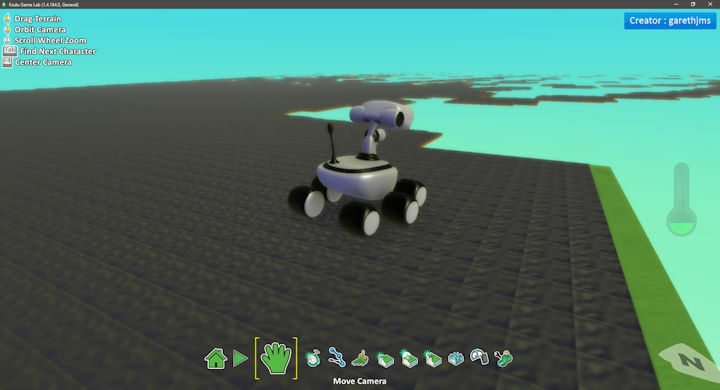 This is Isaac’s latest world, and Rover the robot. Using nothing more than an Xbox games controller (and/or keyboard and mouse) Kodu allows you to easily create games within a simple point-and-click environment. It was amazing to see Isaac get into it and think through how to build his world and program the controller with the basic framework of when X, do Y, e.g. when I press A on the gamepad, fire a missile; when I bump into a rock, make it explode; or when I press the right trigger on the gamepad, make my character grow to four times his normal size. Their experience with Minecraft: Pocket Edition has done wonders for their creativity and problem-solving skills. And so… to my usual Sunday evening routine. Over the next few hours I will sink back into the silence of the flat, enjoy the warmth of the memories of another fun weekend with my children, and look forward to the next one. And prepare for my week ahead.